It was a breezy evening in Paris. Shakespeare & Co was filled with its normal charm and groups of anxious, excited bibliophile tourists. The ka-ching of the cash register couldn’t be missed from outside, which was filling up with hopefuls who wanted to catch a glimpse of or hear a few words from the illustrious Zadie Smith. This would be her second visit to the famous Shakespeare & Co. in Paris – almost exactly one year since her first visit, which I was equally lucky to attend. I waited with three friends hoping that arriving early would equate to available seating. However that wasn’t so easy since this meeting was set up by New York University(where Zadie Smith teaches creative writing) for students and staff. They paid so they got ninety percent of the seating. All the festivities took place outside and that led to a different, noisier atmosphere. Last year it took place inside Shakespeare & Co, where the staff lined tiny little stools among all the available space inside the less than spacious bookstore. It was a tight squeeze but we all made the best of it because we were going to see Zadie. Once all the chairs were lined up outside. We finally grabbed four available seats and just prayed nobody would ask us to give them up. Whew! 7pm came and we were still seated. By this time there was an extremely thick crowd that surrounded the seating making for an impressive turnout. Since I was in the back row i could feel people just behind my chair. The festivities took off right on schedule. Zadie’s opening act was none other than her husband Nick Laird, Irish novelist poet. I had no idea he was going to be there. He was a nice surprise though. His rich Irish accent and his humorous, straightforward poems were refreshing. I’m looking forward to picking up one of his collections. He seemed a little nervous in the beginning but he soon warmed up to the crowd that was obviously mostly there to see his wife. His poetry got lots of laughs and smiles and was an excellent debut before Zadie Smith. At last Zadie started to speak and the silence from the audience contrasted hugely from the cars, trucks, buses and blaring horns that seemed to surround us. Nevertheless, we all had our ears perked up for the story she read us which was a bit of the new novel she’s working on, that she called Swingtime. Love the title and adored what she read. It was about two little black girls and their meeting for the first time and recounting a birthday party they attended. It was all very Zadie Smith – race and class conscious, sensitive, a strong first person voice. It was everything I love about her books. I could see that they inspire each other. The strong first person voice is present in both their work. After her reading quite a few pages 😀 to us the book buying recommenced and the lines for book signing lengthened quickly. It didn’t take too long before I found myself in front of Zadie again. 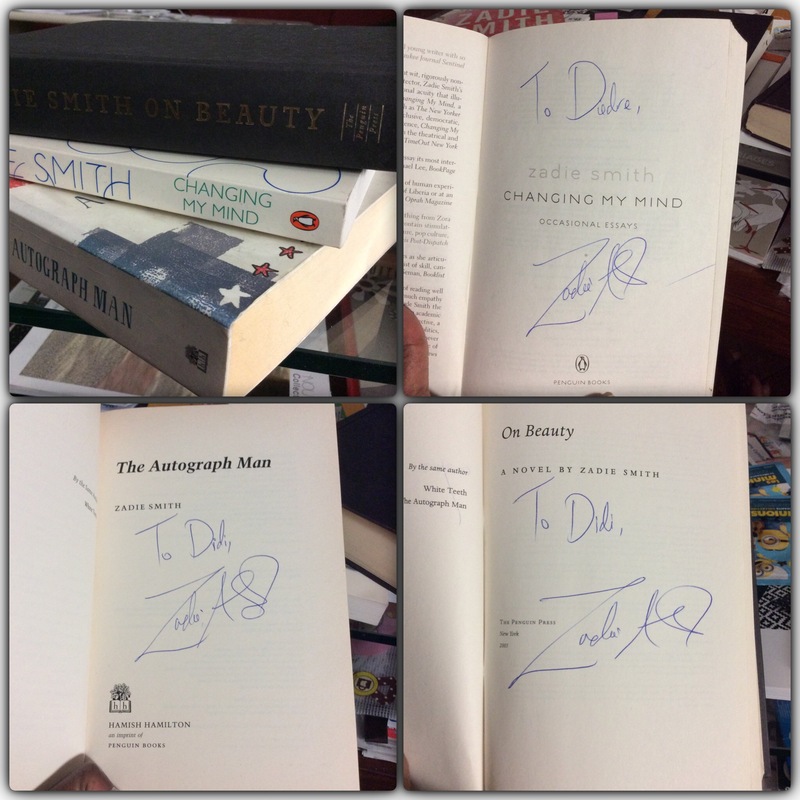 She signed my three books that I didn’t get signed last time – The Autograph Man, On Beauty, and Changing My Mind: Occasional Essays. She was very pretty and dressed in a cute dress which looked thrifted. Her brown turban was covering her hair as usual but making her bright wide eyes stand out on her beautifully freckled face. She was smiling but not nearly as much as the first time I saw her. She seemed tired. All in all I was happy to see her for a second time and hear a bit of the new book she’s working on, which I can’t wait to read. Apparently she’s been working on a film with her husband but not sure when it’s coming out or what it’s about. Sounds a lovely event! I really enjoy Nick Laird’s poetry, what an unexpected bonus! I saw Zadie Smith at the Baileys Women’s Prize for Fiction Shortlist Readings event in London a couple of years ago – she was excellent. Shakespeare & Company is a wonderful bookshop too. Yes like Shakespeare & Co but the prices are astronomical! I liked it twenty years ago when most of the books were used and a lot cheaper. Yeah I was surprised but happily when she mentioned she was working on a new book too. It was fun. What a wonderfully-written post, Didi! I got such a colorful sense of the event’s atmosphere; plus the contrast between Nick Laird’s portion of the program to Zadie Smith’s longer reading and bright eyes, face, and somewhat tired smile. Thanks Leslie! Have been writing more. Have some days off and I find it easier to write when teaching isn’t dominating my life. I really need to get a job I can go to do it and go home and not have to work. Still looking…. 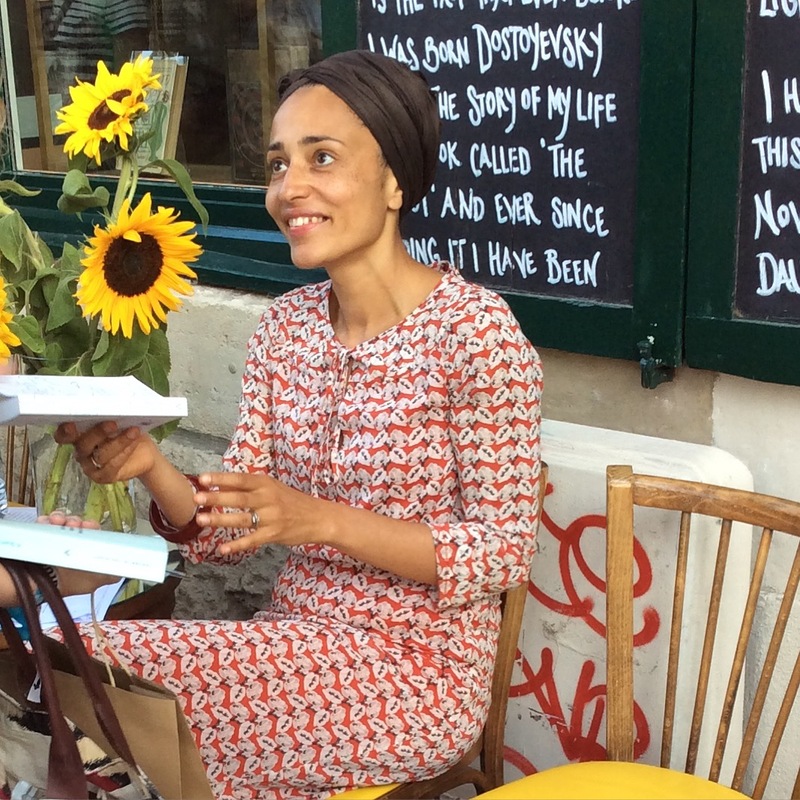 OMG DIDI I CAN’T BELIEVE YOU HAVE ACTUALLY BEEN IN THE PRESENCE OF “THE” ZADIE SMITH TWICE! ! I’m so jealous! She’s my BFF in my head. On Beauty is my favorite by her. Can’t wait for her new novel!